Will definitely be buying this again! Crowd pleaser, smooth, full, great all around. Pretty much my favourite coffee ever. Smooth, non-bitter, delicious and creamy. Amazing in a French Press - fantastic flavour! Really nice coffee. Smooth and universally pleasing. Great to have on hand to offer guests. Supports a great cause too! So glad this coffee is available again on Well.ca. An excellent amber roast. Hope this coffee continues to be available. Our favourite coffee in Balzac's line up. A little milder than their usual roast plus it helps to support a good cause. Thanks for bringing this back in stock. So happy you got this coffee back in stock. The blend is wonderful, hot or iced, and is deliciously gutsy enough for use in either my Breville semi-automatic or my Saeco automatic espresso machine. (Some coffees just don't have enough body or enough acid balance for expresso). It makes a rich, fragrant full bodied cappuccino, macchiato or latte. Ok...I just talked myself into making a cup right now. Yum!! A little jolt of heaven! 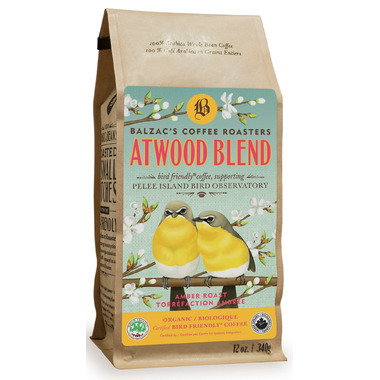 I have been enjoying Balzac's Atwood blend for a year now, the best cup of java you will ever experience.